People who ran various businesses in the 20th century owned many businesses, but the billing system was not that efficient as they had been cheated by their customers. Soon industrial revolution came into existence where printing became predominant in the society. Even though printing of books played a vital role in the industrial revolution, the technology behind started to spread all over the world. Eventually, printing dominated all the fields like finance, textile, media, commercial usage etc. Printers were also designed not only to print commercial papers but also to satisfy minor requirements of various odd jobs. Printers are of various types which involve, dot matrix printer, ink jet printers, laser printer and so on. The dot matrix printer works with a print head which moves in front, back, up and down. The paper is printed with this print head which contains an ink-soaked cloth. The ink-jet printer consists of all characters made up of tiny dots which retain ink and when heated they push the ink on the paper in the form of bubbles. From the above, descriptions it is clear that a printer requires a head, character, and ink to print anything. But, the thermal printers are something different when compared to any other printers. Most thermal printers are suggested for printing receipts as it proves to be more compatible to serve such causes. The significant feature of this thermal printer is that it does not require ink to print the information on the paper. And this is no magic! It is a part of advanced technology and its construction is simple. The thermal printers consist of a thermal head which becomes hot when switched on. The papers which are used in the thermal printers use a special chemical called Bisphenol A which is coated on the paper. It is a heat sensitive material and so when the hot thermal head impacts with the paper, the appropriate letter associated with the head shall get printed on it. Although thermal printers are monochromatic in their design, wax based cartridges can be used to make them operate with colors also. Listed below are some of the receipt printers which works great. 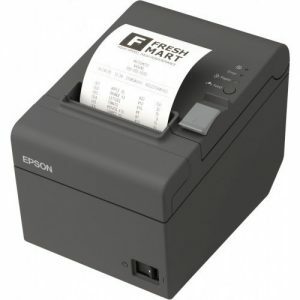 Epson TM-T20II Direct Thermal Printer is an outstanding and robust receipt printer which focuses on the customer service with swift responsive thermal hands. As we know, Epson in the standard organization which deals with the business of printers and photographs and it shall not surprise why Epson TM-T20II Direct Thermal Printer holds an elite position in this list. Connections in this receipt printer shall be made with the USB cable; at the same time, it can also interact with the serial communicating ports. As it uses a thermal head mechanism to print the information, it can provide receipts in no time. Sometimes, the letters shall get smudged due to overheating. Also, make sure that you do not touch the paper with your bare hands as the body temperature shall cause minute discrepancies in the outer coating of the paper. The mean time between failures of this Epson TM-T20II Direct Thermal Printer has been estimated to be 3, 60,000 hours which proves the high durability of this receipt printer. It is made up of a metallic frame which is essential to keep the paper well protected and also it is equipped with LEDs which indicates the error in its function, paper requirement etc. Additionally, the outlet is lengthier which shall allow free flow of the paper thereby preventing wrinkles over it and also the serrated edges along the opening ensures that the receipt has been torn without damaging the receipt. Epson Ready Print T20 Direct Thermal Printer is a less expensive branded thermal printer which provides clear print to the customer. The well-built body of this thermal printer houses an eminent printing device. The Epson Ready Print T20 Direct Thermal Printer is a monochrome receipt printer which can print the information with only one color. The power switch which is present at the side of the device can be switched on only when there is a need with this thermal printer. Apart from that switch, there is retractable feed button which when pressed shall produce the print of the bill. There are also LED enhancements on the body of the thermal printer which indicates the status of the power, feed, and error. Since the outer covering is made up of plastic the weight of this receipt printer shall not be very high and hence it can be carried from one place to another. 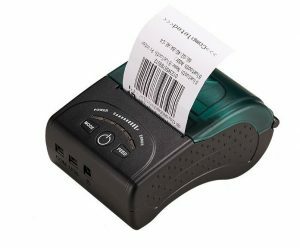 At the same time, Epson Ready Print T20 Direct Thermal Printer is highly compatible to the barcodes like UPC-A, UPC-E, JAN13 (EAN13), JAN8 (EAN), CODE39, ITF, CODABAR (NW-7), CODE93 etc. Star Micronics ECO Thermal Receipt Printer is a printer with a professional look and possesses high durability. It is made up of glossy thermoplastic material which houses all the efficient parts of this receipt printer. Star Micronics ECO Thermal Receipt Printer is equipped with some LED lights which display the status of the receipt inside the printer which includes the power, error LEDs and feed button. The feed button, when pressed by the user, pushes the paper outside with the thermally printed pages regarding the business they have done. The power source required to run this spectacular device is kept inside the housing and a cord to charge the device is provided along with this kit. The lids are on the top which can be opened to feed the paper to the device. Additionally, the paper also comes outside the device from the top of the receipt printer. Unlike ordinary receipt printers, Star Micronics ECO Thermal Receipt Printer automatically cuts the paper after releasing the paper to a particular length. Unfortunately, it cannot be connected with the Ethernet, LAN, Bluetooth, and iPad. Connections shall be made to the device only with the USB interface which is a disadvantage. 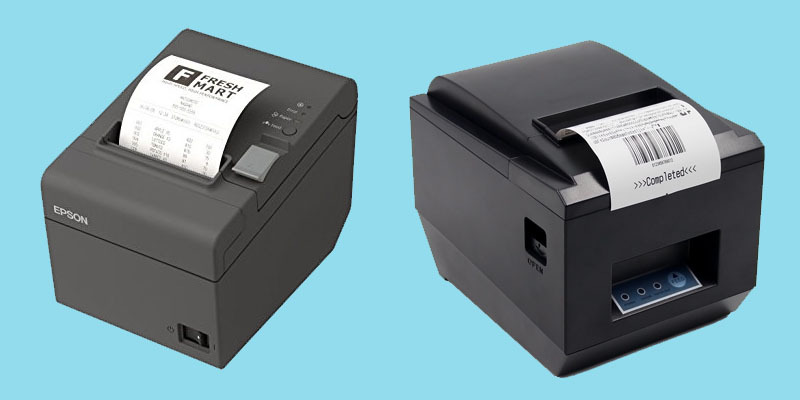 Citizen America CT-S310II Thermal Printer is a skillfully designed printer which can be suitable for even inexperienced individuals to print the receipt even in a rush environment. The speed of this Citizen America CT-S310II Thermal Printer is found to be 160 mm/sec which is really high for a receipt to get printed. This exquisite receipt printer can be connected with the USB interface and also with the serial interface. Moreover, the housing of this receipt printer is made up of thermoplastic which controls entry of heat inside the printer and also a PNE sensor used with it supports the imminent operation of this Citizen America CT-S310II Thermal Printer. Two adapters, one to provide the power to the printer and the other to provide the information to the printer from a system is provided along with this kit. To your surprise, this receipt printer has been made up of halogen-free materials which are really good news to nature guardians. Now, people shall explore the internet to find what halogen has to do with this product? Halogen refers to elements like iodine, bromine, fluorine, chlorine etc. These elements have a low melting point and hence they react with the atmospheric air and temperature to form compounds. Usually, electronic items when becoming inoperative, they are burnt. And then these halogens are released into the atmosphere which eventually leads to the environmental damage. So, it is recommended to purchase products with less halogen in order to save the nature and environment. WELQUIC Small Portable USB Thermal Printer is a versatile receipt printer which has been meticulous crafted even by focusing on minute discrepancies. It is handy equipment which can be suitable in the shopping malls, hotels, restaurants, textiles shops, jeweler shops etc. The WELQUIC Small Portable USB Thermal Printer is robust equipment which is very much compatible with Android, Ios, Linux, windows and many other operating systems. True to the name, the speed of this WELQUIC Small Portable USB Thermal Printer is around 90 mm/sec. The size of this receipt printer is around 13x17x10 cm which is really very small and the weight of this printer is also limited. Hence, it can be carried to any place without any difficulty. The operating procedure of this receipt printer is also very easy compared to many other contemporary receipt printers. Simply open the top cover, place the paper roll, close the lid and start printing. Manuals, CD for the driver, power cable and the data cable comes along with this receipt printer kit to support them to install it easily. A compact slot for housing the status LEDs, power button and the feed button is fabricated in this cute looking thermal printer. The paper rolls need not be replaced frequently and so maintenance issues regarding the WELQUIC Small Portable USB Thermal Printer shall also be meager. 58MM USB Thermal Receipt Printer is precise equipment which allows the user to use it industrial, restaurants and any other business environments. It uses a 58 mm thermal paper which is very small in size. Hence, the printing speed shall be greatly increased and the customer doesn’t have to wait for minutes to get his bill. The high-quality thermal paper in the thermal receipt printers allows the customer to have a clear look at their bill without having any misconceptions between numbers and letters. The clarity of the letters shall be very neat such that distinguishing the numerals 3 and 8 shall be very easy when compared to the clarity of any contemporary device. The low cost and noise are the most required factors in any business location to earn the support of the customers. Proving those factors, 58MM USB Thermal Receipt Printer has emerged as a versatile receipt printer which can provide a noiseless process with least price. MUNBYN Mobile Thermal Receipt Printer is a very small and dynamic printing device which can be used for multiple purposes. Not only in restaurants, hotels, business centers, lodges, etc they can also be used for businesses in which movement plays a major role. Unlike any other receipt printer, MUNBYN Mobile Thermal Receipt Printer comes with the strap which can be hung around the neck of the user or can be hung around the waist. Also, it has reduced weight which helps the device to have a high degree of portability. Moreover, it is compatible with the ios and the Android devices but Android devices require special software called loyverse to produce good results. Since MUNBYN Mobile Thermal Receipt Printer is equipped with the Bluetooth facility users can simply print receipts from their mobile or such smart devices. The speed of the MUNBYN Mobile Thermal Receipt Printer is estimated to be 90mm/sec and so the time taken to print a bill shall be 2 to 3 seconds which guarantees the customer support. MUNBYN Ethernet LAN Receipt Printer has an excellent all-around value due to its multi-purpose features. It is an agile and exceptional receipt printer which can provide a noiseless and quality printing technique. The thermal paper used for this MUNBYN Ethernet LAN Receipt Printer is around 3 inches which are certainly higher than any other receipt printer. Increased paper size shall attract increased font size which can be very easy for the customers to go through their bills. The CD attached with the receipt printer can make the user customize the receipt with their specific logo. The auto cutter option in this receipt printer does not require a human to tear the thermal paper to isolate a customer which an additional feature. It allows usage of USB and LAN to communicate with the peripheral devices around it, but options involving Bluetooth, Wi-Fi etc is not supported by this MUNBYN Ethernet LAN Receipt Printer. The speed provided by this receipt printer is 230mm/sec and so the printing shall be done in no time. Xfox 5890T Thermal Printer is versatile and exceptionally designed thermal printer which works at a limited voltage of 12V. The shape of this receipt printer is very small such that it can hold space less than a book. The speed of the printer is 90mm/sec and that is more than the acceptable level of the thermal printer. The characters can be underlined, bolded, and italicized before it is printed on the paper. The lid at the top of this thermal printer can be opened and closed to store thermal paper of a particular diameter. Xfox 5890T Thermal Printer is also equipped with a CD which makes this thermal printer compatible to various operating systems like Windows 2000, Windows 2003, Windows XP, Windows 7 etc. Additionally, the kit also contains essential items like power cord, data cord, and an adapter. ZK Teko Thermal Receipt Printer is a compact and impressive type of receipt printer which can be very handy and supportive to the user. Due to its minimized size, it can be even kept inside the pockets which endorse the portability option of the receipt printer. It is highly compatible with ios devices and Android devices but, ios devices need a separate app to produce optimistic outputs. The installation of the paper rolls inside the printer is also very easy which can be done in seconds. This printer no ribbons and cartridges, but uses thermal paper to record the data and hence the clarity of the details in the bill shall be extraordinary. The speed of the ZK Teko Thermal Receipt Printer is around 90mm/sec and the resolution of the printed details shall be around 230dpi. But make sure that you don’t touch the thermal head of the devices as it can result in some electrostatic damages.